Spiros Athanasiou was born in Athens in 1978 and was raised in Alejandroupoli, Thesaloniki, Mutilini, and Lamia. He received his Diploma in Electric and Computer Engineering from the National Technical University of Athens (NTUA) in 2001, and since 2002 is a PhD candidate at the Knowledge and Database Systems Laboratory of NTUA. He began working as a programmer in 1997, in various technologies and applications (3D worlds, management information systems, geographic information systems, etc), while since 2004 is working almost exclusively as an IT Consultant, offering his services to the public and private sector. In early 2007 he joined IMSI with the responsibility of organizing and preparing research and development projects in 3rd NSRD, 4th NSRF and FP7. 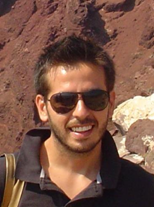 Mr. Athanasiou has active research interests in topics related to geographic information systems and open source software, while he continuously experiments, designs, and develops novel ideas and applications for ICT services.